Let us Repair Your iPhone! uCrack iFix is a premium iPhone Repairs in Brisbane. 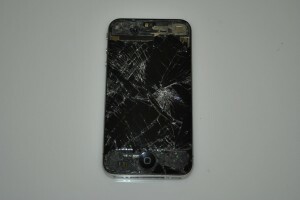 The majority of our repairs are for iPhones and due to this, we have been able to streamline our repairs. Most iPhone repairs are done with in 30 minutes, but if you are in a rush sometimes we can do them in less than 15 minutes. It does depend on the day, and how busy we are. Our most common iPhone repairs in Brisbane are outlined below. We are the industry leader iPhone Repairs in Brisbane, and we were the only iPhone Repairer who made it into the finals of Quest Community Newspaper Business Achievers Award. The Latest iPhone, with a larger screen. If you need a case, don’t forget to check our our range of iPhone 5 case, some as low at $5. iPhone 5 screen replacements are one of our most popular repairs, we have found that often we can’t keep enough items in stock to meet the demand. Due to this our partner organization will repair your iPhone 5 screen for $169. This is a limited time offer, so book now before the parts run out! Click the link below to book at their store, at Chermside and Carindale Shopping Center. Book online and you will get a free Screen Protector or Charging cable. 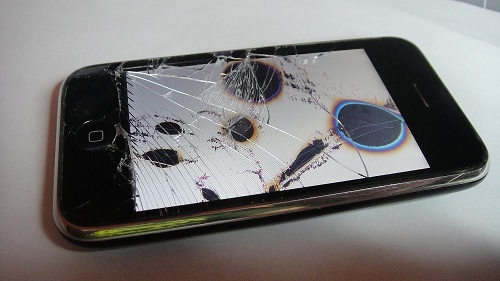 iPhone 4 and 4S repairs are still our most common repairs. Luckily they are also one of our fastest repairs, and are exceptional value. 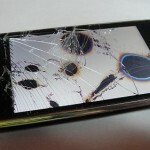 iPhone 4 and 4S Screen replacements are our most common repairs. 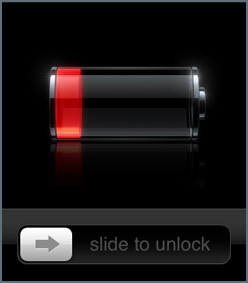 We can have your phone repaired in 30 minutes (iPhone 4) or 60 (iPhone 4s). It doesn’t matter how cracked your screen is, or if the LCD is also broken. With our repairs, we replace the entire front screen, which is called the full front assembly. We do this because you get a better fitting repair, which conforms with our quality standards. Often when you drop your phone, it isn’t just the front screen that cracks. It is also the Back. We do offer discounts if you need both your front and back replaced, but we have individual prices as well. Our Back replacements only take a few minutes, but you still need to book in. After a couple of years the iPhone 4 and 4s batteries start to reach the end of their life. 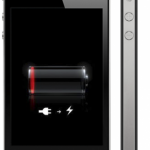 You will start to notice that your iPhone battery is not lasting as long as it use to be, it is possible to replace a battery in an iPhone 4 and 4s, it only takes about 15 minutes. 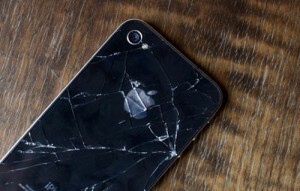 iPhone 4 and 4s do suffer from fault home buttons. This happens after a year or two and you will notice that the home button doesn’t always respond when you touch it. This is a really simple fix, and only takes 30 minutes to replace. uCrack iFix also sells cases and accessories for iPhone 4 and 4s. So check out our range at the uCrack iFix Online Store. iPhone 3G and 3gs are getting quite old now, however most people have them as a replacement or spare phone, some even give them to their children. They are a very robust phone and can stand repeated abuse. However sometimes the screens will crack, but not to worry they are a low cost and quick repair. The iphone 3G and 3Gs is made up of two parts. The top layer is the Glass and Digitiser. In 90% of cases you will just need this replaced. Check the image below to see if your phone looks like the photo. If it does, you just need your glass and digitiser replaced. It is a very simple repair, and very cheap. 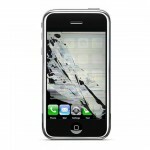 The second most common repair for iphone 3G and 3Gs’s are LCD replacements. Often an LCD replacement will need to be performed if you can’t see anything on the screen, if it shows a white screen, or if it appears that the ‘ink’ is running. 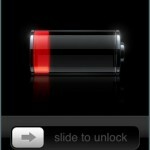 As the iPhone 4 and 4s, the 3G and 3Gs suffer from home button problems. They need to be replaced after a few years, and are a very simple repair which takes no time at all.